This may just end up being my ugliest, most photographically uninspiring post to date. I'm thinking that maybe I should just give up any caramel-related baking/candy-making in my kitchen. It never goes well. So I'm working my way through this week's little list of comforting projects with my children. Yesterday's simple project was to make some miniature caramel apples. Last week, when I was sitting in the doctor's office, I was thumbing through some parenting magazine–Family Fun? Parents? Not sure which. Anyway, I saw this little recipe that showed bite-size caramel apples. I didn't get to read the how-to because I was called in to see my doctor, but I remembered a melon-baller, toothpicks, and melted caramels. I guess it would have been good to see the directions. I was feeling pretty confident going in to things yesterday. Even went out and bought myself a melon-baller–something my kitchen was lacking. I quickly discovered it is nearly impossible–okay, impossible for me–to make a perfect little circular apple bite like I saw in the magazine. 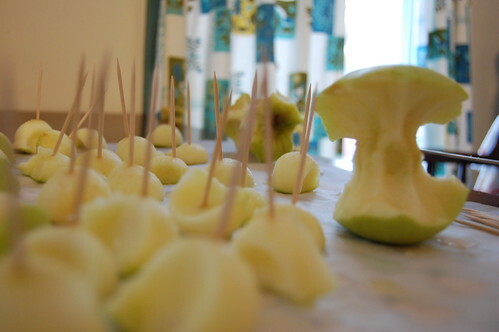 As I made apple "chunks" with my melon baller, I had my kids stick toothpicks in all of them. I soon realized that the apples were turning brown too quickly and I hadn't even started melting the caramels bits yet. So being the quick thinker that I am, I had the girls dip all the apple chunks into lemon juice to hold them off while I melted the caramel. Oh, I'm such a genius….I thought. I melted the caramels and by this time, I had lost the attention of all my kitchen help and I was left to dip the balls myself. Fine. No biggie, sometimes, I admit, it's easier this way. I started dipping, only to realize that my children didn't do a very good job of securely pushing the toothpicks into the apples. Before long I was fishing for chunk after chunk of apple in the quickly thickening, extremely hot caramel. When I set the apples out on the parchment paper, I realized to my horror, that all the caramel was dripping down the sides of the balls, not sticking to the apple chunks at all and pooling all over the paper. And thanks to our generously sloping kitchen floors, was snaking it's way off the parchment paper and almost onto the floor. So, then I decided to grab the one apple I had left and jam a popcicle stick into its top and coat it with the remainder of the caramel. I was determined to have some success in this deal. We'd divide up that apple and all share bites of its caramel-y, sweet and sour goodness, or something. I dipped it in, set it out to harden…and then my kitchen help decided to reappear. I forgot to mention that when I started this project, I thought it would be yummy to dip the apples in chopped peanuts. So I had a little plate of nuts sitting at the side. Then I changed my mind. But while I was in the pantry trying to salvage the last of the caramel, my "help" decided to dip (drench) my only successful apple in the nuts. They patted on layer after layer, rolled it, dipped it…only to weigh it down so heavily with nuts that all the caramel sludged off the sides of the apple and puddled around the bottom. Meanwhile, I was in the pantry desperately trying to figure out something to do with this remaining cup of caramel. Being the caramel genius that I am, I poured the rest out onto a baking sheet and then covered it with granola. It was the only thing I had on hand that I could think to dip into it. And at the moment it seemed like a really yummy combo. I left it to cool and harden. I thought just maybe I had invented some new candy, some gourmet treat. Not so much. Pretty much just a puddle of chewy caramel with granola floating on the top of it. So anyway, a good kitchen failure is good for keeping the old ego in check, I suppose. I guess next time I'll just swipe the magazine out of the doctor's office so I can actually follow the directions of someone who apparently has mastered the art of working with caramel. Or I'll just avoid caramel all together and stick to the store-bought, ready-made stuff when I need a fix. Next up….turnips. Yes, turnips. One of the "perks" of having your husband work with a LOT of farmers? I always get interesting farm-fresh produce left on my kitchen counter. Strangely, my children are clamoring for me to fix turnips tonight for supper. Something to do with their obsession with Little House on The Prairie, I suppose. Any suggestions? I've heard just cook them up and serve them like mashed potatoes. I'll be sure to report. I know it’s too late but I love turnips roasted with potatoes or even sweet potatoes and of course onions. I remember seeing that same picture while waiting somewhere but also didn’t check to see how they did them. Too funny. Good for you for trying though. OMG this is too funny. Were you in my kitchen last night? I was making the same thing. And, really hard to get the dull edge of the melon baller through the skin of a Granny Smith apple, ya know? I put the finished ones in the fridge overnight, thinking it would slow down the browning of the apples, and this morning all of the caramel had “melted” off of them. Guess the moisture in the apples, or whatever. Whatever. I’ve only ever roasted turnips, or had them in beef stew. Now that I’m vegetarian, the beef stew is out. Oh boy–you poor thing! Yes, a little kitchen failure is needed every now and then. That way, determination kicks in and your dishes reach a new high the next time around 🙂 At least that’s what I say! I love turnips. I have made them like mashed potatoes along with parsnips, carrots and other root veggies. Lots of butter–yum. Or slice & salt, and bake like Terra Chips. Better luck with the turnips! Mashed turnips are excellent! I have mashed 1/2 and 1/2 with potatoes and carrots, as well as cauliflower. Roasting the turnips are always a quick and yummy method, too. I also roast turnips with olive oil, sea salt, and an onion or a few shallots. Roast the turnips . . . about 425/450 degrees . . . salt and olive oil . . . 30-45 mins . . . add sweet potatoes, onions and garlic for a veggie party. Very good! Oh no! I wonder why the caramel didn’t stay stuck? The lemon juice maybe? Hmmm. But I am laughing at the turnip obsession. Too funny. Oh, my. What an exciting cooking project. Not that it helps you much, but we’ve all been there. I remember making muffins with a classroom full of 3 year olds and, well, I’ll spare you the details. As for the turnips, yuck! I have no suggestions other than to get rid of them, stat! We love turnips in our house! I just boil and mash with a bit of butter and salt, although roasting them sounds divine! I seem to remember my Mom having the same problem with making caramel apples with melted caramels when I was a kid. She even bought these kind of circular sheets of caramel that you would fold up around the apple, into a little package of sorts, but they were fairly ugly and not all that appetizing. Or….instead of roasting your turnips, you could hollow them out and carve sweet little faces. I think I saw that in Martha Stewart years ago. I tried it once and they sort of came out. I hang them from the ceiling on my porch. Nothing like Martha’s. For a minute there thought you were going to dip the turnip in caramel. Turnips are my favorite thing, yes, mashed up with salt and pepper, milk and butter, just like mashed potatoes. the downside of turnips is they smell pretty bad while cooking. The rest of my family has never gotten past that to actually enjoy turnips. But I am a good New England girl and the smell just makes me anticipate devouring turnips! Oh my, I saw the caramel apples in F.F. and I thought maybe I’d give it a try. It looks like it might be more trouble than it’s worth though. I bet they tasted yummy regardless. now i’m having a traumatic flashback to the Caramel Apple Incident of ’03. An old college friend of mine used to peel, boil and mash ’em like potatoes and add all the usual suspects – milk (or cream if you want to go nuts) with butter and perhaps some parmesean (I’m too lazy to look up how to spell that tonight). It was delicious. As far as keeping one’s kitchen ego in check: last night I added cayenne (by accident) instead of a few red pepper flakes to a meal I’ve made maybe 100 times (tortilla pie) and fed it to my children. Smoke came out of their ears. Oops. Thank you for making me laugh tonight – I needed it. Will it help to have a link for the project? Because I totally found it for you! Your post today has me laughing out loud. Not at you….but at the me-ness of you today. It all sounds sooooo familiar!The good thing about caramel is that even if it looks horrible it usually still tastes pretty darn good! ….no ideas for the turnips…. Boy, I haven’t visited your blog in quite a while. I scrolled down and had a look at some of the pics….your home is delightful and looks like such a lovely place to grow up. Stay warm! I too was worried you were going to dip the turnip in the caramel! I think turnips are yummy, and usually just use them in a roasted winter vegetable dish. But I’ve also had sliced turnip fried with a creamy cheese sauce– “turnip au gratin” I suppose! I REALLY hate to tell you this… or maybe it will make you feel better?… but they didn’t really use caramel on the mini-apples. They used peanut butter chips, if I remember right. Because, yeah, caramel will not stick to any part of the apple but the peel… and that’s kinda iffy too. You may have had better luck dipping the turnips. That is too funny! Sounds like something I would do. I seem to have a knack for making easy projects difficult. I followed the link to the Family Fun recipe that Sarah posted. They make it sound so easy. I love one of the comments on the recipe…”Even the smallest girl was able to make these with very little assistance.” That made me want to cringe! It is different taste and all but I love it, in Sweden they have turnip mash with diff meals and I loved it. i actually made those caramel apples for our Halloween party last weekend and they worked awesome! i think the main things is to use melted butterscotch chips, and to make sure that the stick goes through the skin part of the apple (makes it more solid). i also used a lollipo stick cut in half. The kids LOVED this recipe! I will be making some today for the classroom as well. The good thing is that if you cover all the white part with the butterscotch chios, then you don’t need to worry about the apple browning at all and they keep well for a couple of days. I was giggling all the way through this! Then I came to the comment Amy made about cayenne and nearly exploded! My mother accidentally picked up the wrong spice jar and tipped cayenne instead of cinnamon into apple crumble – on one of the first nights my boyfriend (now husband) came to dinner! Naturally he was the first to taste it! We LOVE turnips at our house and if we can, eat them rather than potatoes. My husband makes something he calls “turnips faux gratin”. This is basically boiled and mashed turnips with cream and butter, some cheese in a dish, with breadcrumbs on top, baked to pure perfection. somehow better than plain old mashed, but only two more very satisfying steps. Everyone knows that ANYTHING tastes better with breadcrumbs!!! Oh you made me laugh (in a kind of nervous way!) I read your post just as I was about to start mine…. no pressure there then! OK, you’ve completely cured my from wanting to make miniature caramel apples. We bought caramels to melt, and then ended up just eating them. Lol. So I guess you could say that I gave up cooking with caramel before I ever started. Oh, yes, carmel apples. Ours turned out well, but my younger daughter got a nasty burn from the carmel! Ouch! This is why I just buy caramel dip! I’ve never made turnips. I hope they are good — I’d like to try them. Don’t know if someone already sent this on to you, but this might be the recipe you were looking for! I had a different sort of suggestion…. Simply ask the receptionist to photocopy the recipe for you on the way out. Having worked in a doctor’s office for years, I’d much rather take a second to photocopy something than to have our magazines go missing…. Sorry your apples turned out bad. 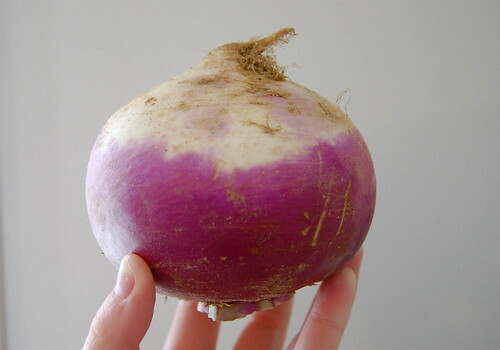 Yay for turnip! i’ve had a similar experience with the miniature caramel apples. i have no suggestions, as i have not attempted to perfect said project. it was too traumatic. 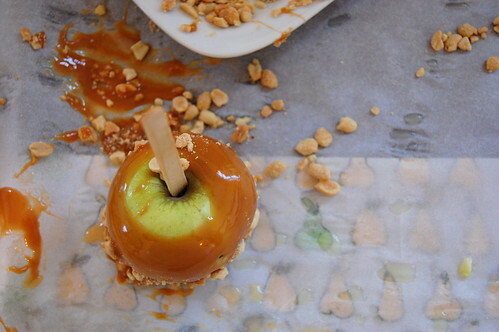 Yes, we tried caramel apples once. ONCE. And never again. Now turnips, just used one in my soup tonight. Thanks for giving this to us who are prone to kitchen disasters as much as successes. If you haven’t discovered Deborah Madison’s cookbooks yet…they’re delicious, seasonally inspiring and veggie. Her Green’s cookbook has yummy individual turnip gratins with finger toast. I recently saw a toffee apple recipe that also had chocolate coated apples which looked great, I think I might try some!